Bea's of bloomsbury is a bakery with restaurants across London. Serving breakfast, lunch and afternoon tea. Plus sweet treats to take away. Bea's impressive display of cakes and pastries are sure to make your mouth water. Beautiful wedding and celebration cakes can also be made to order in store or online. Bea's of bloomsbury first caught my attention with their ingenious hybrid. The "duffin". A duffin is a cross between a doughnut and a muffin. I ordered a nutella duffin on my way out of Bea's of Bloomsbury St Paul's branch. I enjoyed a vegetarian afternoon tea on a wet and windy day. Afternoon tea is the perfect treat to brighten up a dull day. 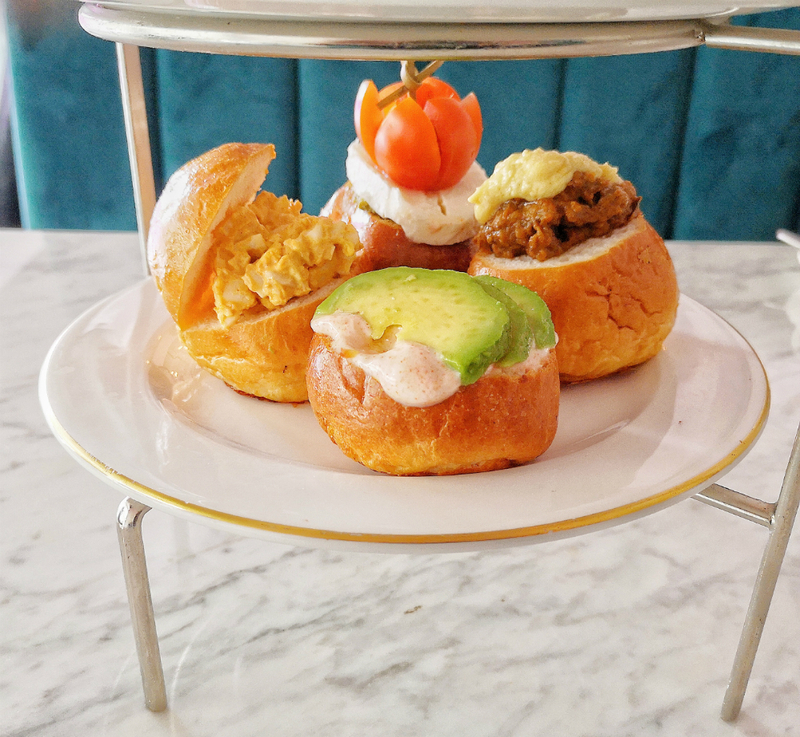 Bea's of Bloomsbury have three afternoon tea options. Including vegetarian afternoon tea and gluten free afternoon tea. We were seated upstairs at Bea's, St Pauls branch. The restaurant is in a lovely location. Close to St Pauls, which means you also have the option of visiting the cathedral, to truly make a day of it. For a casual restaurant and bakery. The venue decor and location of Bea's of Bloomsbury, straddles the line between casual and fancy. 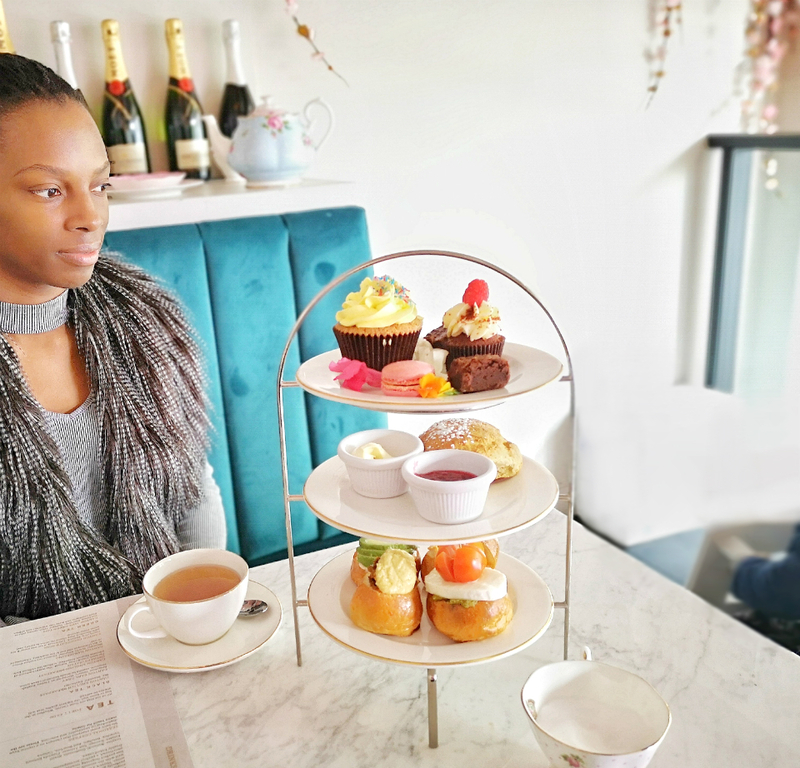 Bea's is a great option for a semi-casual afternoon tea, date or celebration. Bea's of Bloomsbury is also child friendly, with high chairs available. The floor to ceiling glass windows at Bea's of Bloomsbury - St Pauls let in natural light. Allowing you to watch the world go by. There are twelve teas to choose from at Beas of Bloomsbury. All teas are by Canton. My first tea of choice was Canton chocolate noir. A black tea, with dark chocolate notes. Canton chocolate noir just tasted like a regular black tea to me, which was disappointing. On the plus side. You get to refill your tea pot with as many different teas as you'd like during afternoon tea. The second tea I tried was Canton karma tea. Canton karma tea is a herbal tea with spices. To me, it tasted just like chamomile tea. My third and final tea was Canton jasmine pearls. It was very mild in taste, but with a lovely fragrant smell. I was impressed by the selection of vegetarian sandwiches available. Each presented on brioche style bread. A roasted aubergine and hummus. Mozzarella, pesto and basil. Egg mayo with smoked paprika and a dukkah yogurt sandwich, with avocado and pesto. All were very flavoursome. However, I only enjoyed the egg mayonnaise with smoked paprika sandwich. You can choose from a plain, or sultana scone. My scone was freshly baked, with a crusty outside and soft crumbly inside. It was served with clotted cream and strawberry jam, with the extra option of apricot jam. The cake selection included a macron. Mini cupcake. Salted caramel and chocolate brownies, and a delicious cupcake with passion fruit frosting. Afternoon tea for one is super filling. I left Bea's with a doggy bag of cakes to finish off at home. This is a review of afternoon tea at Bea's of Bloomsbury. St Pauls branch. Bea's of Bloomsbury is a bakery and restaurant in London. Breakfast, lunch and afternoon tea are on the restaurant menu at Bea's of Bloomsbury. 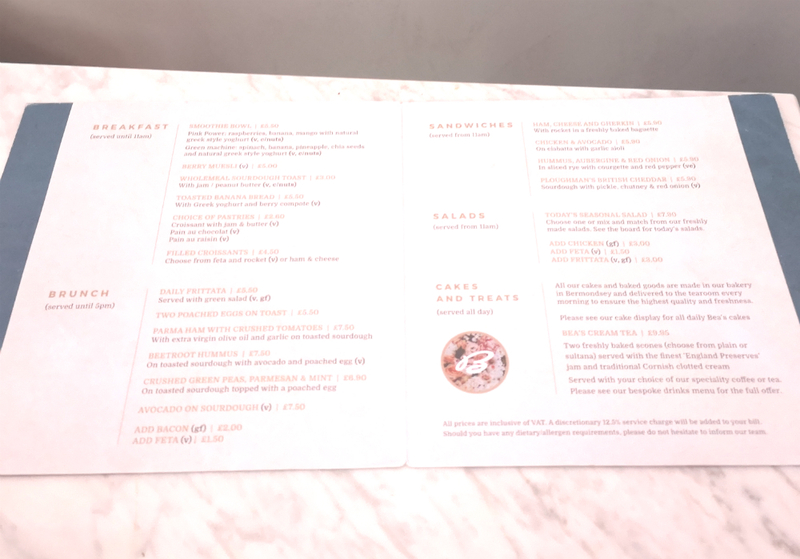 The menu at Bea's of Bloomsbury in St Pauls London during the time of visit and at the time of this post includes meat, vegetarian and gluten free options. All information was correct at the time of listing. Bea's of Bloomsbury Watling Street is described online as "Light-filled, glass-fronted cafe with teapot lampshades, for light lunches, cake and afternoon tea." Further details taken directly from Bea's of Bloomsbury website are as follows : Telephone : 020 7989 4099 The photos of food in this blog post which were taken at Bea's of Bloomsbury Watling Street London. Along with any text and personal opinions about Bea's of Bloomsbury cafe and menu are copywritten by said owner of www.bestafternoonteainlondon.co.uk The photographs and text on this blog must not be copied. Distributed. Sold or printed without prior written consent of this blog owner. Contact this site owner for more details.